Most tire pressure gauges for cars and trucks measure PSI (pound-force per square inch) starting at 5.0. Gauges made to read the lower ATV tire pressure typically start at 0 and go up to 5.8 PSI. For ease of use, look for a gauge that has a non-slip rubber handle and an easy-to-read LCD digital display. Retailers like BikeBandit have several choices. The tires on your ATV will come with a recommended PSI, but follow the vehicle manufacturer’s instructions instead, recommends Outdoor Life. It determined the best air pressure for tires on the specific vehicle you have. For example, Honda recommends a 3.6 PSI on both the front and rear tires for its TRX 420. 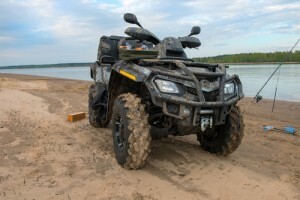 If you do not have the owner’s manual for your ATV, visit the manufacturer’s website as it likely will have the booklet available for download. Tires heat up and expand with use, so measure before you head out for a ride or at least three hours after for accurate readings. Start by unscrewing the cap on the tire’s air valve. Press the tire pressure gauge against the valve until you do not hear air escaping. Hold the gauge in place until the readout stops on a measurement. Add or release air as needed to meet the manufacturer’s recommendations, and then confirm PSI by measuring again. Move on to the next tire until all have been checked and adjusted. 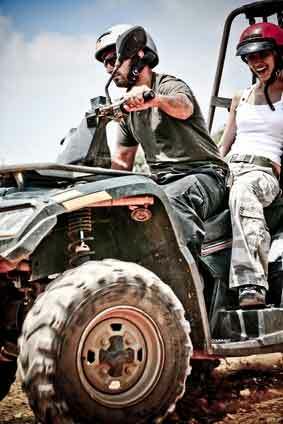 Note: Because tire pressure has a direct effect on ATV safety, it should be checked before each ride. Also, as the tires wear down they lose their ability to properly maintain air pressure, making it an even more vital part of your pre-ride checklist. 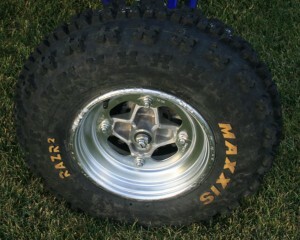 Polaris, for example, recommends replacing tires when tread depth gets down to 1/8 inch or less. 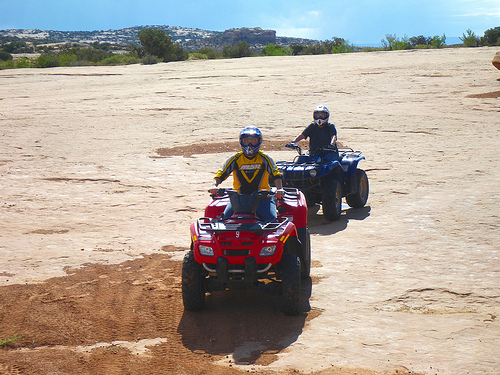 If you are hauling your ATV to a trailhead, you should check the air pressure in your car or truck’s tires, too. Because you likely have passengers on a regular basis, you are keeping them safe as well. The National Highway Traffic Safety Administration recommends checking tire pressure at least once a month and making adjustments to meet manufacturer’s guidelines. It also suggests measuring PSI before long trips and more frequently if you live in an area of the country with especially cold winters. When it comes to wear, the NHTSA recommends replacing tires when treads get down to 1/16 inch. 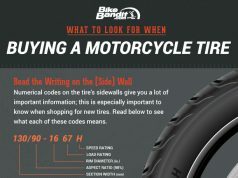 Tires also come with wear bars you can check to see when it’s time to go shopping. And, of course, there is the tried-and-true method of determining wear by placing a penny in the tread with Lincoln’s head pointing down. Replace your tires when you can see all of his presidential head.